Amund Dietzel was born in the town of Kristiana, Norway in 1891. He went to sea at the tender age of fourteen and learned the art of hand tattooing during those early sailor years. In 1907 while serving on the bark Augusta out of Fredrikstad, Norway, Dietzel was shipwrecked on the Saint Lawrence Seaway in eastern Canada. Dietzel made it to shore in a lifeboat with a few others and once the ship was deemed unseaworthy Dietzel started looking for work. Within a few months Dietzel hopped a train, crossed into the United States and settled into New Haven, Connecticut. 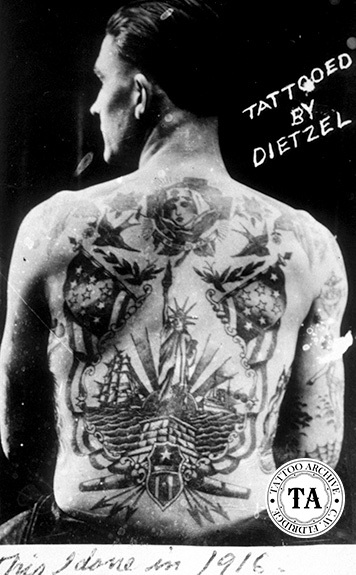 Instead of looking for work in the maritime industry, Dietzel decided to peruse his tattooing. He traded in his hand tools for a new fangled electric machine and started a career that spanned half a century. 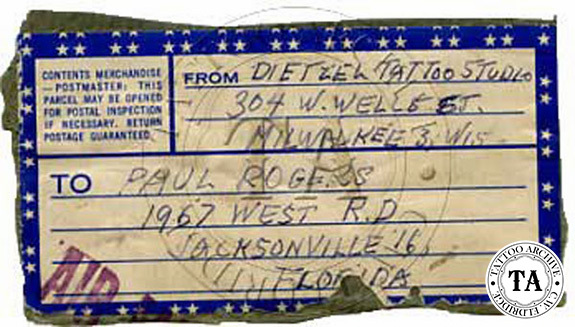 As with other tattooists of his era, Dietzel worked in many cities, including New Haven, Connecticut, Albany, New York, Detroit, Michigan, and Columbus, Ohio. In Columbus he met and befriended Fred Clark, Randy Webb and Fredrick Boehme other show tattooists. In 1913, during the off-season he made the move to Milwaukee and tattooed in an arcade. Dietzel was married the next year and may have planned to settle down, but he had sawdust in his veins. By 1916 he was back on the road as Professor Amund Dietzel and his new wife filed for divorce. Around 1919 he had enough of living out of a suitcase and settled back in Milwaukee working at several different locations. It was around this same time that Nick Melroy started working on two tattoo machine frame designs that went on to be associated with Dietzel. In the 1930's Dietzel moved to larger quarters at #948 Plankton Avenue in Milwaukee. It was here that Dietzel had the space to gear up for the wartime business that was heading his way. 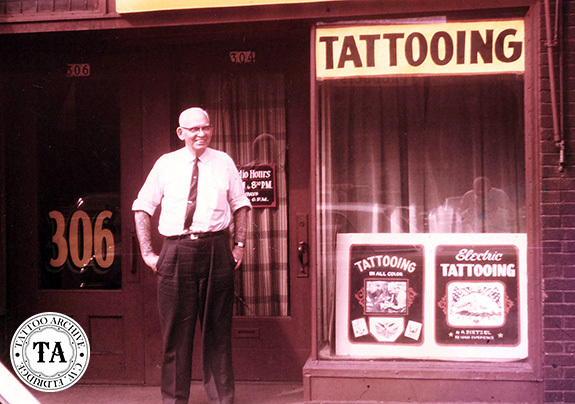 During World War II, the Plankton location had four tattooists (including Dietzel) working 12-hour shifts. Amund Dietzel made the move to #612 North 5th Street after thirty years on Plankton Avenue and then moved again to #304 Wells Street. Unfortunately, Milwaukee got caught up in the legislation against tattooing, and in 1967 outlawed tattooing within the city limits. Dietzel's comment was, "At least it took the city 51 years to find out it doesn't want me. Milwaukee used to be a very nice town." For the complete Amund Dietzel story see Jon Reiter’s books These Blue Arms, The Life and Work of Amund Dietzel Volumes 1 & 2.